LEGACY OF CYNTHIA is an alternative metal band formed in 2010 inspiring by the magic of their birthplace Sintra in Portugal. Since then the band has been delivering an alternative sound inside the metal spectrum. Driven by an intense and profound rhythmic section, and stimulated by the melody and the technique of the guitars and vocals, the band managed to make their mark in the Portuguese circuit. The band achieved recognition by self launching the EP “Voyage” and their debut album “Renaissance”. 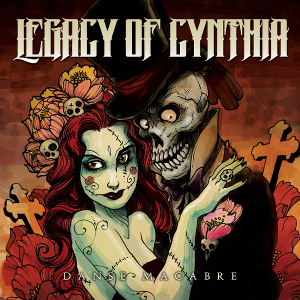 In October 15th, LEGACY OF CYNTHIA released their second full length album “Danse Macabre” through Raising Legends Records. “Danse Macabre” contains 13 tracks and tells an allegory on the universality of death, which reflects the idea that no matter the status, creed, race or religion of a person in life, the dance of death unites us all. Without letting go the identity of the band, it's more rich and diverse, yet more cohesive and with an intense melodic and emotional charge. The album was recorded, produced, mixed and mastered by Caesar Craveiro at Fingerprint Studios in Sintra, Portugal. Executive producer is André Matos from Raising Legends.